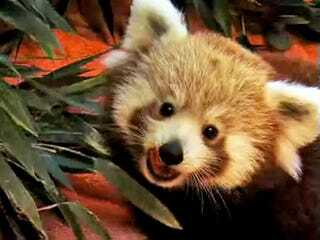 Did you know the titular "firefox" of web browser "Mozilla Firefox" is not a pyromaniac fox, but a red panda? To clarify this, Mozilla has embarked on the cutest marketing ploy ever: adopting baby firefoxes and putting them on webcams. Firefox LIVE also has cub naming contest (my idea: "Julia Allison") and a clever marketing ploy: If enough people download Firefox 4, the baby firefoxes get a treat. They are currently 56% of their way to earning a jungle gym. Can you imagine how cute these baby firefoxes will be playing on a jungle gym?! This is the most effective consumer incentive I have ever encountered, and I say that as a woman who won a tub of Beanie Babies at the mall in fourth grade.